Reports are coming in about PayPal's new design. "Does anyone else have a problem with PayPal's new format," asked one reader. "Now, I can only see the fees they charge at the end of the month in the monthly report or item by item." It's important for her to know the actual fees for each transaction since she sells on consignment. She did write back after spending a lot of time searching and found a report under "Activity Report, Basic Report." However, she wrote, "it is a hidden feature and I think it should be front and center." - Not showing existing balance in wallet, "so you can not transfer your funds, and your money is stuck in PayPal," she wrote. - "Not showing your total amount of money for each month in your financials." - "Confusing issues on how to send and request money - lumping sending and requesting money in one link." This can get you into trouble, she said, if you accidentally send money instead of requesting it from the seller. This seller also wrote back, forwarding me an email from PayPal where it acknowledged the first issue, writing, "We do apologize if there's system issue for transferring funds to your bank account. We are aware about this issue and we're still working on it, we appreciate your patience." Sellers discussing the changes on the eBay boards said they disliked the changes and many of them were trying to revert to the "classic" view, though one said the reports in the classic view are not set up as they had been. 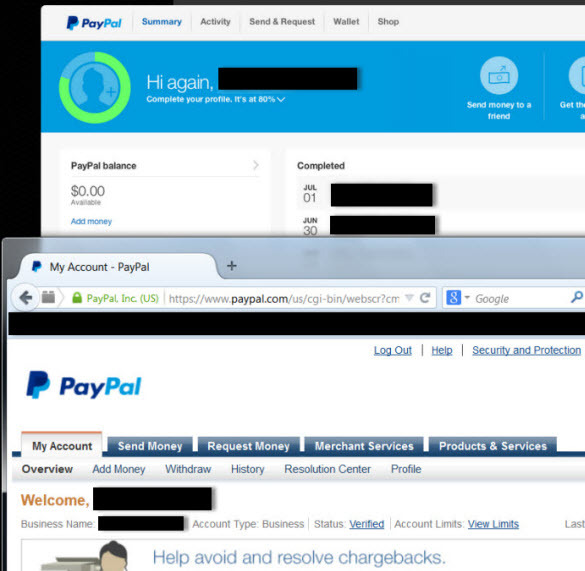 Above: Screenshot of new PayPal design on top, old design on the bottom. A search of Twitter found many people (not necessarily sellers) liking the new design, though it's unclear if it's simply the home page redesign PayPal previously rolled out, or whether they are seeing the new changes to the inside pages. It is absolutely horrible. I have never understood why eBay/PayPal change things that do not need to be changed. They went from a design that looked organized and professional to a design that looks like it was created by grade schoolers. "They went from a design that looked organized and professional to a design that looks like it was created by grade schoolers." That's because e commerce and especially ebay and PayPal is dominated by young MBAs with no real business experience; they simply went from K through b school with no intermediate job stops to teach them even a little about real world business. They know little or nothing about nor do they care about the real business world or the day to day needs of their customers. What they care about are freebies whether we're talking free soda from the vending machine or free stock shares. They're far, far more interested in meeting their own needs than meeting customer needs. Their middle school aged underlings also with no business experience are eager to create bullet points on their resumes for their next dotcom job. They're either much too insecure or much too arrogant to consult with the wealth of business experience their customers have to develop customer friendly platforms that serve customer needs rather than their own. Both ebay and PayPal have far too many employees outside of customer service which is predictably understaffed or ineffective because, after all, we nothing more than "noise." PayPal and ebay are notorious for hiding and burying critical information. In this case, they don't want you to know how much they're taking from us each time you log into PayPal. This isn't much different than when ebay stopped showing the FVFs on FP listings when the item was listed. What is nothing short of nauseating on the 'new' PayPal sign in page is the statement that there are no buyers or sellers -- just people. Big time barf right up there with ebay being only a venue and that people are basically good. I called and told PayPal and told them the exact same thing. If I were to say anything past that here I'd appear a maniac so I'll just hold it and maniac inside. Oh, I need another Zoloft and a Lorazepam, thanks ebay and now PayPal. @Rexford, I'm spun for all of the simple of mind ignorance. I meant to say: I called PayPal and told them the exact same thing. I HATE the new design! I took PayPal's survey and told them I hated it. I sent a message through their Facebook account and told them I hated it and how could I get back the old design. Their response: You can't. And what's with the big button that reads "Send Money to a Friend"? Are they hoping people will see the words "Send Money" and click on that to pay for goods, so PayPal can suspend a huge chunk of users for fee avoidance? There is absolutely nothing I like about their up-dated look. It seems like the new design is catered toward teenagers and not serious business persons. I've been with Pay Pal since the beginning. I think the new interface is anything BUT user-friendly. When I have a week to figure it all out, I'm sure I'll adjust, but I wish successful pages didn't change just to keep the developers busy. The morons at Paypal could burn water without even trying. Could it be because paypal's new boss is Donaghue. He's disrupted ebay and now he's disrupting paypal. Mine is still the SOS. What I have noticed is my account is a Premier, not Business account as show at the top. Maybe they haven't gotten to all accounts yet? Mine is still the same SOS too. More changes completed for the sake of making changes obviously designed and approved by corporate one percenters who neither use nor understand how the remaining ninety nine percent of the population uses their site. Horrible design, coupled with zero notice and even less information. Typical for the disconnected company eBay & now PayPal have become. Either, David Marcus approved this interface and functionality change knowing full well he would not be around to face the complaints from users or, his temporary replacement - John Donahoe - decided PayPal was due for some destructive innovation to distract users from eBay's many ongoing failures. One other possibility.... John Donahoe green lighted the change despite the mess knowing he could slough off the responsibility for the horrid design on the now departed Mr Marcus. We dumped ebay, now we might have to dump paypal also. The user interface appears as if it was designed for a very small screen (cell phone) or a toddler, simply puerile. Every time JD runs paypal, problems appear, his influence is unmistakable. This guy forces all his untested ideas though without resistance from other paypal brass. Perhaps getting rid of paypal is the next logical step to becoming de-Donahoeized. This mans work is so destructive, getting away from contributing to his madness is the next step. It will be nice once we extend ourselves out of his grasp. Ebay/paypal under Donahoes control is toxic. Vote with your feet. Well now that JD has put his sticky fingers on Paypal as interim CEO, it looks like Paypal will be sold as scrap. Maybe Icahn can get it for pennies on the dollar. I am convinced that this company is purposely being brought down for personal gains. It's impossible, no reasonable business would do such a thing. One day we might find out the truth. But overall it does not matter one bit, because PAYPAL is part of ebay, and we are going to get rid of both of them anyway, this just speeds things up. WORST COMPANY I have ever dealt with, and too far gone to save, so let them keep destroying themselves, there are tons of other online payments to select from. And the DUMBING DOWN OF AMERICA CONTINUES! Other countries are NOT doing this. They probably did this to keep pace with each new wave of functional illiterates that this nation is now willing to slide through our school systems. IF any of you are parents, you NEED to start demanding better of the schools and your children. Perhaps Paypal tired of being burdened with usefulness and practicality. Never mind how disconcerting I find the login page with its in your face video. The emotion I have is of someone suddenly jumping into my personal space. Or even worse, like I'm looking through someone's window. I try not to look and move past it as fast as possible. The glitch I found on the first day the new format was shown to me was no link to multi-order shipping. The Paypal reps couldn't find it and they suggested I return to the classic view. I haven't tried the new format again. I'm still stuck with that annoying giant video face page which seems to be spreading across the internet like a plague. My 1rst impression when I log on to see that mess. It was a ''WTF!?''. I don't like the design. It isn't easy to read. PayPal is a service like a bank style. I want to see clearly my statements/updates. I don't want to deal with a ''new'' design thinking it is like a Photobucket or Facebook. I'm convinced the confusion is intentional. The new design makes it nearly impossible to determine an accurate account status. Couple that with the HOLDS, PENDINGS, INCOMPLETE and COMPLETEDs, PayPal is making bank with our money. If you add up the various float subterfuge with the number of PayPal accounts, the answer is crystal clear: customer satisfaction is a canard and nuisance compared to this daily float theft. Perhaps the Geezer Bandit had the correct approach.